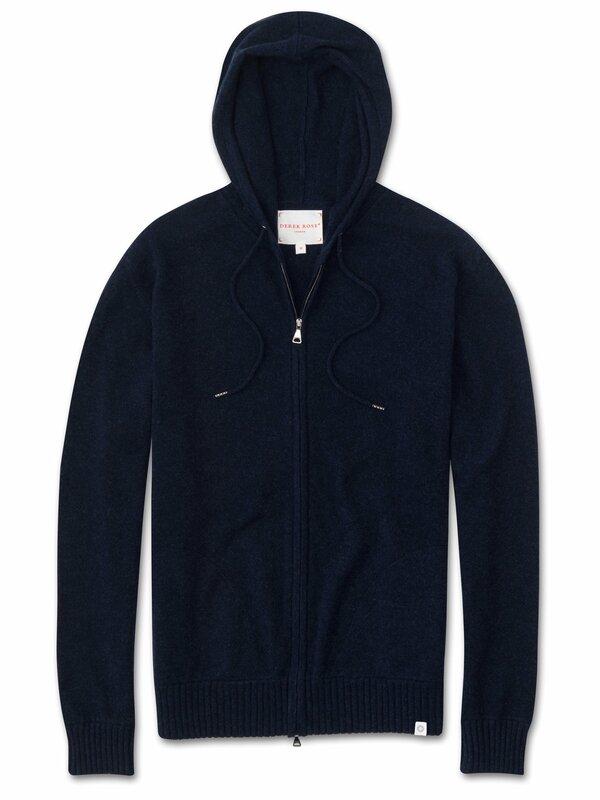 Our Finley men's hoodie is the perfect way to keep warm on a chilly Sunday morning. This relaxed hooded top has a smooth zip opening to add a sophisticated spin to your off-duty style. The Finley hoodie is one of our premium line of luxury contemporary loungewear, born out of the desire to craft an off-duty wardrobe that matches up to the highest sartorial and quality standards. Our philosophy is to use the finest materials and components, paying attention to every detail of construction, so that the resulting garment is both comfortable and stylish. The starting point for Finley was the grade of pure cashmere we chose — a luxuriantly soft 100% cashmere made by Loro Piana which we consider to be best in class; a reminder of the heights of softness that only the finest cashmere can attain. The next step was the cut. Finley is cut for comfort, with a relaxed fit ideal for lounging. The aim was to create a garment which looks effortlessly chic but is still as comfortable to slip into as a favourite tracksuit.